ONALASKA, Wisc. — A police department in Wisconsin has removed a prayer plaque from its walls following receipt of a complaint from a prominent professing atheist organization. 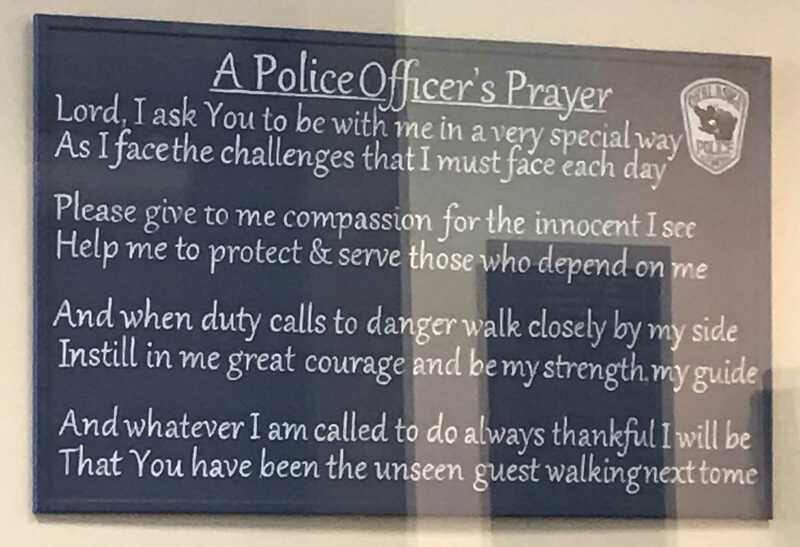 The Freedom From Religion Foundation (FFRF) recently sent a letter to the Onalaska Police Department after being informed by a local resident—who it left anonymous—that a “Police Officer’s Prayer” plaque had been displayed on the wall in a public area of the police station. FFRF asserted that the display was unconstitutional because it called upon God for strength for the duty. “While it is laudable for the OPD to recognize the challenges officers face and to promote compassion and courage in law enforcement, these sentiments may not be couched in the religious message that a God should be [the] officers’ ‘guide’ in their work, and is responsible for officers’ success and safety,” its correspondence read. “Anyone viewing this display would understand the OPD to be endorsing religion and belief in a God,” it said. The organization also contended that the prayer plaque could make those who identify as atheists and agnostics to feel like outsiders in their community. FFRF cheered the news that the display had been removed from the walls of the police station. “Nonbelievers in Onalaska will now feel fully included, as they should be in our secular state,” said Co-President Annie Laurie Gaylor in a statement.